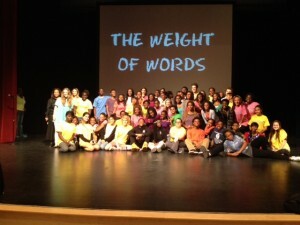 Boca Raton Community High School takes center stage as students at four Palm Beach County high schools simultaneously perform the powerful anti-bullying musical “The Weight of Words” on Tuesday, February 3rd from 6:45 p.m. to 8:30 p.m. – and the entire community is invited to the free local performance. Unified to start a critical call-to-action throughout Palm Beach County, Boca Raton Community High School will be joined by Forest Hill High School, Palm Beach Lakes High School, and Seminole Ridge Community High School that will host their first community performances of “The Weight of Words”, a musical drama written and produced by students based on their personal experiences. Boca Raton Community High School will perform at Zinman Hall, 9901 Donna Klein Blvd. in Boca Raton. Students and adults must present ID at the entry gatehouse for admission to auditorium. “The Weight of Words” puts a magnifying glass on the topic of bullying and its effects within a home, a school, a community, our nation, and throughout the world. The audience hears directly from teens who explore the issues from every angle – the kids being bullied, the bullies themselves, bystanders, parents, teachers, principals, community leaders and lawmakers. Parents, students (ages 12 and older) and the greater community-at-large are encouraged to attend. The simultaneous performance initiative done in partnership with the School District of Palm Beach County was born in Boca Raton and underwritten by Boca Raton’s Promise (BRP) as part of its BOCA BRAVE movement; the Boca performance is partially funded by Norman & Ruth Rales Jewish Family Services. Boca Raton Community High School is one of seven public schools (elementary, middle and high school levels) in Boca Raton designated by BRP as a BOCA BRAVE educational partner to ignite conversations to break the silence on mental illness and influences that impact it. “The Weight of Words” was conceived, written and composed by students of the Nova High School Drama Department and the staff of the Lovewell Institute for the Creative Arts. It was introduced to the School District of Palm Beach County through the efforts of Boca Raton’s Promise – The Alliance for Youth, a nonprofit organization dedicated to identifying mental health needs and resources in our communities, and providing education and activities for early identification and access to services. District schools identified teachers and students to form troupes in four areas to implement the first year for youth to lead an anti-bullying initiative. For more information about the February 3rd community performances of “The Weight of Words” in Palm Beach County, contact Rita Thrasher at Boca Raton’s Promise at (561) 866-1850. For more information on Boca Raton Promise and its BOCA BRAVE grassroots awareness campaign to break the silence on mental illness within the Boca Raton community, visit www.bocaratonspromise.org and click on BOCA BRAVE, “like” Boca Brave on Facebook, follow on Twitter, or call (561) 866-1850 or email bocabrave@BRPromise.org.